Professor Deborah McGregor joined York University’s Osgoode Hall law faculty in 2015 as a cross-appointee with the Faculty of Environmental Studies. Professor McGregor’s research has focused on Indigenous knowledge systems and their various applications in diverse contexts including water and environmental governance, environmental justice, forest policy and management, and sustainable development. Her research has been published in a variety of national and international journals and she has delivered numerous public and academic presentations relating to Indigenous knowledge systems, governance and sustainability. She co-edited Indigenous Peoples and Autonomy: Insights for a Global Age with Mario Blaser, Ravi De Costa and William Coleman (2010). She is co-editor (with Alan Corbiere, Mary Ann Corbiere and Crystal Migwans) of the Anishinaabewin conference proceedings series. Indigenous Environmental (In)Justice: theory and practice. (Insight Grant). Co-applicants: Dayna Nadine Scott (Osgoode Hall Law School), Brenda Murphy (Wilfred Laurier University), Martha Stiegman (Faculty of Environmental Studies). Collaborators: Mary Ann Corbiere (Laurentian University), Kathleen Padulo (Chiefs of Ontario), Sue Chiblow (Garden River First Nation), Nancy DeLeary (Chippewas of the Thames). Indigenizing the First Nations Land Management Regime. (Insight Development Grant). Co-applicants: Heather Dorries (Carleton University) and Gabrielle Slowey (York University). Indigenous Knowledge Transfer in Urban Aboriginal Communities with Professor Kim Anderson (Wilfred Laurier University); and Exploring Distinct Indigenous Knowledge Systems to Inform Fisheries Governance and Management on Canada’s Coasts with Professor Lucia Fanning (Dalhousie University). Prior to joining Osgoode, Professor McGregor was an associate professor in the Department of Geography at the University of Toronto and served as Director of the Centre for Aboriginal Initiatives and the Aboriginal Studies program. She has also served as Senior Policy Advisor, Aboriginal Relations at Environment Canada-Ontario Region. In addition to such posts, Professor McGregor remains actively involved in a variety of Indigenous communities, serving as an advisor and continuing to engage in community-based research and initiatives. Professor McGregor coordinated an Indigenous Environmental Justice (IEJ) Symposium in May 2016 featuring the voices of women and youth. She also recently launched an IEJ website. Research Interests: Indigenous environmental justice, Indigenous governance and law, sustainability, water governance and security, and Indigenous knowledge systems. 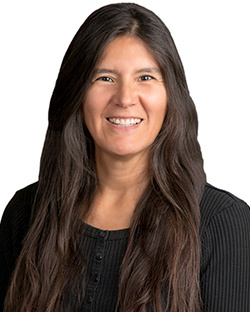 Graduate Research Supervision (LLM, PhD): Professor McGregor is interested in working with students interested in Indigenous environmental governance, including, Indigenous knowledge systems, Indigenous legal traditions/laws, water justice/security, climate justice/change and environmental justice and policy. Professor McGregor is interested in students with excellent research and writing skills. Opportunities for community based research/data gathering are possible through two SSHRC grants held by Professor McGregor.